Blue and White party leaders slam 'weak' defense policies of PM Netanyahu in tour of Gaza envelope, promise restored deterrence. 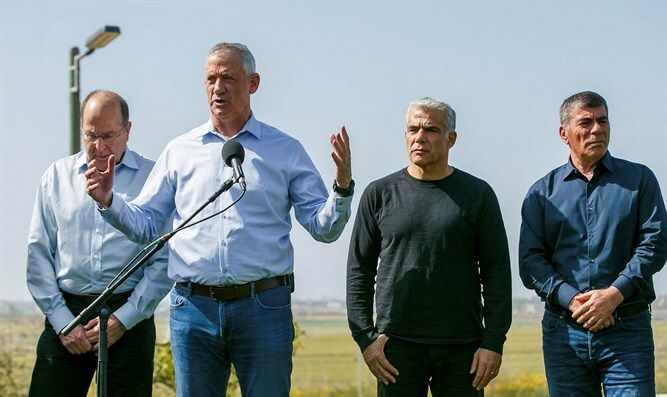 The leaders of the Blue and White party toured the Gaza border Wednesday and criticized the security policies of Prime Minister Netanyahu. "My friends and I spent hours in this important place," party leader Benny Gantz said. "Behind us is a long challenge. And before us are the settlements that must be preserved." According to Gantz, "In the 3.5 years following Operation Protective Edge there was absolute quiet. There were no rockets, no balloons, not kites. But apart from advancing the barrier, nothing was done. We will change this loose policy and apply tough policies." "We will demand the return of the POWs and missing persons. We will advance aid to residents of the Gaza Strip without compromising security. If they attack us, we will apply tough policies and if we need to. we will go back to targeted assassinations. Hamas understands what we said. "I see here behind us a Hamas that needs to be defeated and not the High Court of Justice, but it's no wonder that in a government that adopts Kahanists and an education minister allows himself to incite against the most important state institutions [cannot see this]." MK Yair Lapid said, "Last October I stood in Be'er Sheva opposite the house of Miri Tamano, alongside her, which was destroyed by a Hamas rocket, and I said then that it was not possible that Miri's house was destroyed and Yahya Sinwar was still standing ... A few days after that Sinwar had a party. And so I said: This is how deterrence is not produced: Very little time later, 500 rockets and mortars landed on the residents of the Gaza periphery, and the Israeli government did nothing to stop it, and the cabinet in which the three of us sat together obtained deterrence for three and a half years. This deterrence will be restored." Former Defense Minister Moshe Ya'alon said that "those who are behind us here in the Gaza Strip and Hamas' leaders know us, they know us from Operation Cast Lead, from Operation Pillar of Defense, and Operation Protective Edge." "When balloons and kites began to spread here, this contempt led us to an escalation: the breach of sovereignty is a red line and we pay the price. This is the language in the Middle East and that is what we intend to do, not to speak of words of haughtiness," Ya'alon said. Former IDF Chief of Staff Gabi Ashkenazi said, "We met today, not for the first time, with young people in the communities and kibbutzim of the Gaza envelope, who decided in spite of the difficult reality here to build a home and raise a family. They require security and a sense of security. The reality here is unbearable. It is inconceivable that an entire region would be a hostage of Hamas. It is the failure of a weak policy. We will replace it with less talk and more actions and strength."